4 amp breaker may be use with Flagg-Air 340 aerators and P101FA Timer. Reduces downtime. 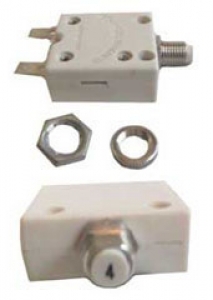 Eliminates need for spare fuses. Housing is white plastic with centrally located reset button. Amperage and voltage ratings stamped on the cover. 7 amp breakers also available.